Media: Canvas, acrylic paint, chalk pastel, ink, paper, aluminum. Painting with a background collage that is done by layering pictures in a way that they overlap each other but still show. The painting was done with smooth touches of a rough brush giving the cloth effect. The skin/flesh was done with mixing a combination of colors (red, brown, yellow, white) in specific ratios/proportions to give different tones of the flesh color and when painting playing with the shades as to where the light hits the face depending on the angle where the light is placed. Orange and blue ink were put at the top and were let to dribble towards the bottom of the painting to add a more artistic feel to it – in a way, more life to it. Some words and quotes were added diagonally to help understand the message and blend with the concept of the collage. There are no restrictions in the Islamic law that prohibits a woman from working or having a profession. In fact, by definition, in a truly Islamic society, there must be women physicians, women nurses, women teachers, -because it's preferable- also to separate teenagers in the volatile years in high school education. If she chooses to work, or if she's married with the consent of her husband, she's entitled to an equal pay, not for equal work, but for work of equal worth. The main artists that inspired, influenced and made me want to incorporate collage into my piece were Kurt Schwitters, Raoul Hausmann and Nick Gentry. Each of them has his own touch to their work that I thought maybe I could pick up a thing or two from each and make it my own way representing my views and the reality that the world isn’t aware of due to the major role that the media plays misrepresenting women in Islam who are the leaders of this world. To the foreign world, Women in Islam are misinterpreted and their rights as to what the other side of the world believes are none existent. Little do they know that women in Islam have got rights and are equal men. I chose to work with the field of women and their rights to work in Islam and included Muslim successful women who shape this world and help generate a better generation after all, they are the ones with a strong willpower that has overcame many painful experiences, first of them is the miracle of giving birth. The piece featured a women that was painted in the middle who I take as a women who represents me that is influenced and amazed by the women that are surrounding the painting (collage) as I do hope someday I will make it as big as they are right now and help influence the younger coming generations. 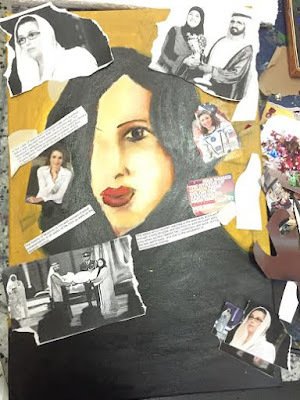 To the collage, I added a few words of empowerment to show everyone how women in Islam are being misrepresented and in some parts of the world mistreated due to the false belief that women are less than men when in reality women aren’t and Islam made that clear several times in many Qura’anayat and hadith’s. This piece is to every Muslim woman out there who has been mistreated by the uneducated world whether it is for what she is wearing or for what she believes in. You are strong and you have already achieved enough and have come far.